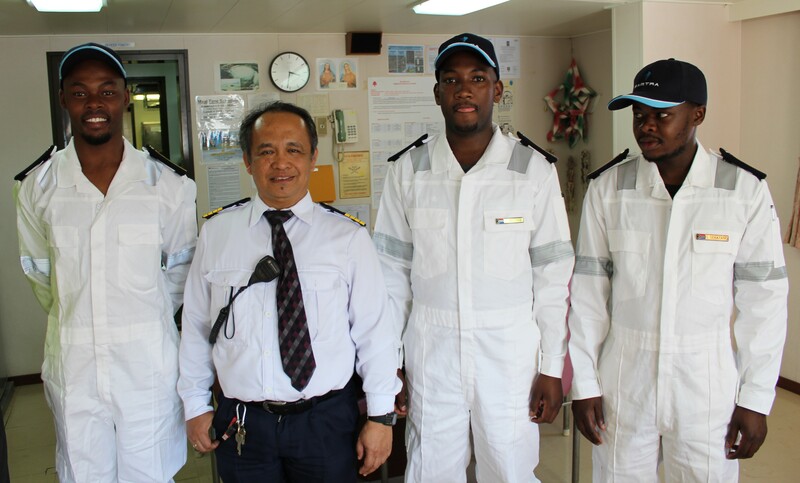 Three South Africa youths made history in South Africa’s maritime economy sector here at the weekend when they boarded the country’s first registered cargo ship since the dawn of democracy. The youths, two from the Eastern Cape – Samkelo Ndongeni (25) a deck cadet from Ngqushwa near King Williams Town, and Thembani Mazingi (24) an engine cadet from Cofimvaba, and the third from Nelspruit, Mpumalanga; Gordon Sekatang (26), also an engine cadet – were taken on board the newly registered vessel at Saldanha Bay Friday for a hands-on ship management practical training scheduled to last six months. The trio’s first travel aboard the Cape Orchid – a 32 day one way journey went underway at the weekend to China where the 279m long cargo vessel will off-load some 170,000 tonnes of iron ore – the vessel’s first trade cargo from South Africa since its registration under the country’s flag. Posted on September 28, 2015 September 28, 2015 by sfayoPosted in Breaking NewsTagged cadets, Cape Orchid, Commander Tsietsi Mokhele, Gordon Sekatang, maritime sector education, Nelson Mandela Bay, Nelson Mandela Metropolitan University, NMMU, Port Elizabeth, SA International Maritime Institute, SA Maritime Safety Authority, SAIMI, Saldanha Bay, Samkelo Ndongeni, SAMSA, seafarer trainees, Thembani Mazingi, training and skills development, Vuka Marine. Next Next post: South Africa’s inaugural Ocean Festival heralds the country’s new marine sector tourism and leisure strategy!